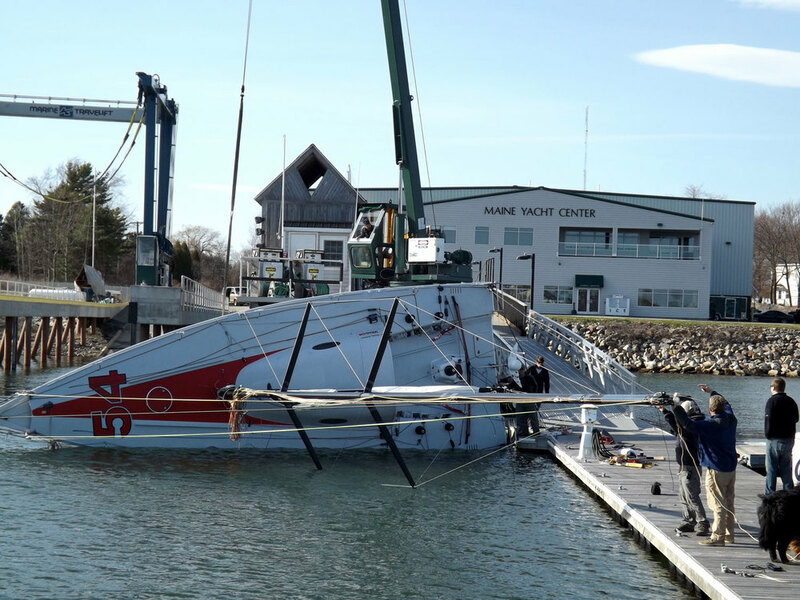 MYC completes refit on Class 40 "Dragon"
Maine Yacht Center has completed the refit on Dragon, an Owen Clarke designed Class 40 offshore racing yacht. Dragon was refit during the winter of 2013-14 in preparation for the Route du Rhum, a single-handed trans-Atlantic race from France to Guadeloupe which starts in November. The main focus of the refit was to make the boat more competitive and lighter. Design and engineering services were provided by Owen Clarke design, U.K.
New Articulating Bowsprit to improve downwind VMG’s. The fixed bowsprit was removed and a section of the bow was cut away. A new bow section was built to incorporate a bearing for the sprit to rotate on as well as receive the strop for the head stay. The foredeck was cut away and a new section was built with a step to accommodate the inboard arms of the sprit when they travel transversely. A new bow pulpit was fabricated to fit the new bow sprit. 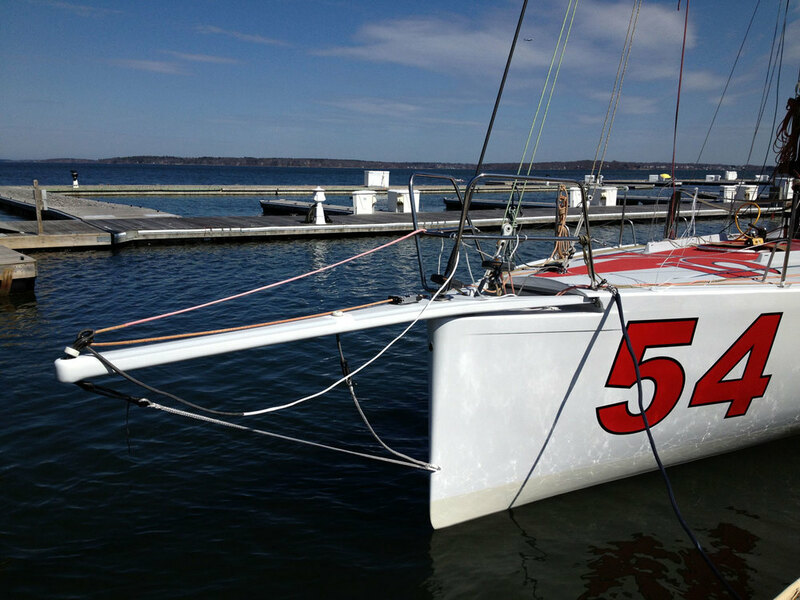 Mast – Original carbon mast was replaced with a new carbon mast to reduce weight and lower center of gravity. Mast was built by Axxon Composites in Romania and shipped as deck cargo direct to Portland, Maine. Keel Bulb – As a result of global weight savings achieved during the refit, 140 kg of lead was cut off from the trailing edge of the bulb. A composite cone was built and installed to retain the as designed bulb profile. Water Ballast System – plumbing was modified and a new, custom built, high volume pump was installed to increase tank fill and transfer times. Hatches – Custom, cored panel construction hatches were built to save weight. Deck – new non-skid paint was applied to the deck, cabin and cockpit. Rudders – new self-aligning upper rudder bearings were installed. Bottom – new race finish anti-foul. White on bottom and orange to keel and rudders. 90 Degree Test – Because of the significant weight savings achieved during the refit a new stability test was required to empirically prove that the pull up force at the mast head was still within Class 40 rules. Dragon will compete in the Atlantic Cup and the Newport-Bermuda race this summer before sailing to France for the Route du Rhum. For more details, see our PROJECT PAGE here.